When I took my daughters to see The Fault in Our Stars, we saw the preview for the upcoming film, If I Stay, based on the book by Gayle Forman. And while I was hoping the TFIOS would fulfill our rip-your-heart-out movie quota for the year , I knew as soon as this preview started that there was to be yet another traumatic movie going experience in our future. And I’ll admit I was intrigued too. Of course I had to read the book. One, because I know my girls will want to read it. And two, because I cannot resist the opportunity to feel superior to all the people in the theater who have not read the book. If I Stay is the story of Mia Hall, a classical cellist and the daughter of former punk rock parents. From the beginning of the novel , we see that Mia’s is a happy, close-knit family. Her relationship with her parents is easy and laid back, and she adores her nine year old brother Teddy. When her school calls a snow day, the entire family decides to take advantage of the day off and enjoy a family outing. Unfortunately, the outing turns tragic when their car is hit by an oncoming truck. It takes Mia a few minutes to realize what has happened. Her parents are dead. She and Teddy are horribly injured. And she is watching the entire scene unfold from outside her own body. This is of course confusing to Mia. How can she be lying in a hospital bed unconscious and at the same time fully aware of what is going on around her? It is in this state that Mia realizes that the decision to live or to die is up to her. The chapters that follow alternate from Mia watching what is happening at the hospital to flashbacks of her life before the accident. In these flashbacks we learn about Mia’s life. Her parents are cool – permissive yes, but loving and devoted to their children. This is a refreshing change from so many YA novels in which the parents are detached, selfish, clueless and more messed up than any teenager, Still, some parents of teenage readers might want to discuss the Hall’s lax parenting style. For example Mia’s parents seem to be fine with her sexual encounters in her upstairs bedroom. And when Mia gets her first boyfriend, her mother is quick to offer to take her to Planned Parenthood and to give her money for condoms. But the real story of Mia and her parents is their deep love for each other. In fact, their deaths are the main reason Mia considers giving up the struggle to live. She can’t imagine a life without the family she loves. But there are other people Mia loves too. Her best friend Kim comes to the hospital and reminds comatose Mia that she still has a lot of people left who love her and want her to stay – aunts, uncles, cousins. There is a particularly moving passage in which Mia’s grandfather talks to Mia about her decision to live or die. And of course there is Adam, Mia’s boyfriend. Her flashbacks detail their romance, one her mother describes as real but inconvenient at 17. Adam is the lead singer in a punk rock band. In a lot of ways, he is more like Mia’s parents than she is. Her impending admission to Julliard and his rising singing career are a source of difficulty for the young couple. As far as teenage romance novels go, the relationship between Mia and Adam is in some ways easier to take than others. It is more mature, less desperate. One version of the novel’s cover (see above) contains a review stating this story will appeal to TWILIGHT fans. Perhaps, but unlike Bella Swan, Mia is accomplished and self-possessed. She does suffer from the same unfortunate “why me” response when Adam first notices her, but her entire existence and self-worth are not dependent on him. If that were true, his love would make her decision about staying or leaving easy. But it isn’t. In fact in spite of his love, the thought of staying behind without her parents is almost unbearable for Mia. Bella Swan, on the other hand, was willing to ditch her parents in a heartbeat to follow Edward into immortality. So yes, Mia is a much stronger character than Bella, but I’m still waiting for the YA novel in which the girls knows how awesome she is before the boy falls in love with her. The thing that is conspicuously absent from this novel is Mia’s concern for what will happen, where she’ll go, if she decides to die. At one point she wonders if death will be just like a deep sleep, but other than that she spends little time contemplating eternity – Heaven, Hell, judgement, abyss, God, or an afterlife. Hers is not a religious family, but they are not atheists, and they do sometimes go to church. Her grandmother’s beliefs about the afterlife – people becoming angels in the form of an animals – crosses her mind, but in general, Mia seems more concerned about what living will be like than what being dead will be like. This novel is not anti-religion or void of spirituality. Rather, these things are only alluded to and not explored. Perhaps this type of temporal thinking is realistically typical for a 17 year old. But still, in a novel that tackles the subject of choosing life or death, one would hope the main character might wrestle with these questions. 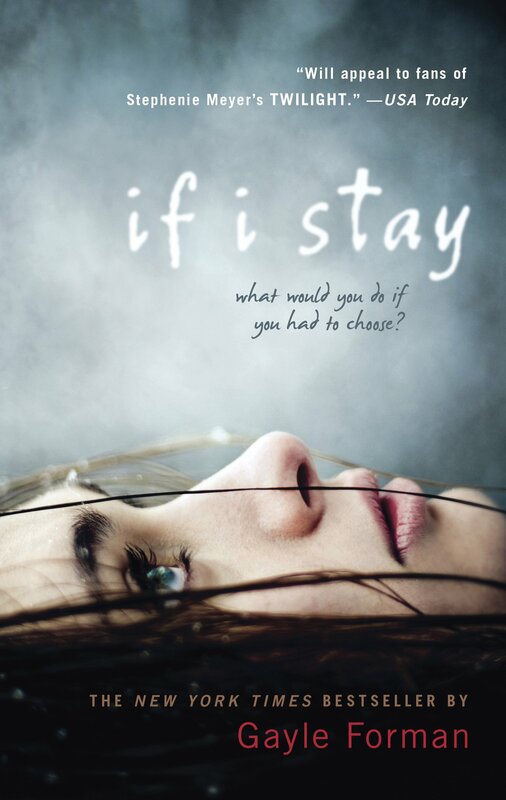 However, even though Mia doesn’t, the reader of If I Stay certainly might be inspired to do so. Yes. Mia’s mother in particular is a big cusser – the F word included. There is a scene that takes place in Mia’s bedroom that is not graphic (in fact it’s not entirely clear how far they go), but it is very sensual. There are also references to making out and to Adam sleeping over. Still, Mia and Adam’s sexual relationship is not a major part of the novel or even of their relationship. Mia’s grandmother does believe that some of her relatives have returned in the form of animals, but Mia does not seem to take this too seriously. None. We do not get any details of the accident; however, Mia does describe how her parents look lying dead in the snow. Very sensitive readers might find this disturbing. 1. Do you think Mia’s relationship with her parents might be different if they were less permissive? Less cool? 2. Do you agree with Mia’s mother that sometimes you can fall truly in love too soon? 3. Mia doesn’t give a great deal of thought to the afterlife. Do you think this is realistic or do you think someone facing her own death would be more apt to consider the afterlife? 4. What is Mia’s relationship like with her brother, Teddy? Why do they share the bond that they do? 5. Do you think people in a situation like Mia’s can will themselves to live or to die? 6. Do you think people in a coma can hear people talking to them? 7. Like Bella in Twilight, Mia can’t quite believe that Adam really likes her. She feels unworthy. Do you think it is common for girls to base their worth on the boys who like them? Do you think that Mia is ultimately a stronger character than Bella?